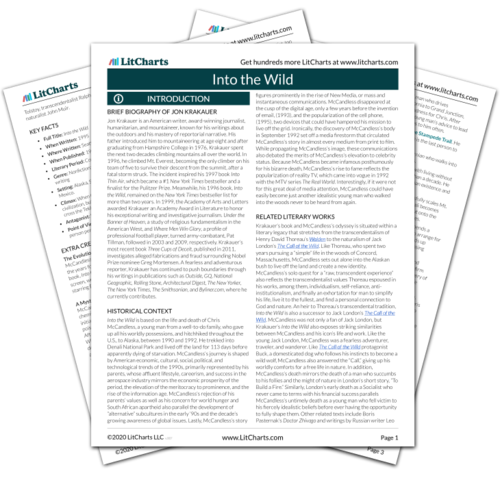 Welcome to the LitCharts study guide on Jon Krakauer's Into the Wild. Created by the original team behind SparkNotes, LitCharts are the world's best literature guides. A concise biography of Jon Krakauer plus historical and literary context for Into the Wild. A quick-reference summary: Into the Wild on a single page. In-depth summary and analysis of every chapter of Into the Wild. Visual theme-tracking, too. Explanations, analysis, and visualizations of Into the Wild's themes. Into the Wild's important quotes, sortable by theme, character, or chapter. Description, analysis, and timelines for Into the Wild's characters. Explanations of Into the Wild's symbols, and tracking of where they appear. An interactive data visualization of Into the Wild's plot and themes. Jon Krakauer is an American writer, award-winning journalist, humanitarian, and mountaineer, known for his writings about the outdoors and his mastery of reportorial narrative. His father introduced him to mountaineering at age eight and after graduating from Hampshire College in 1976, Krakauer spent the next two decades climbing mountains all over the world. In 1996, he climbed Mt. Everest, becoming the only climber on his team of five to survive their descent from the summit, after a fatal storm struck. The incident inspired his 1997 book Into Thin Air, which became a #1 New York Times bestseller and a finalist for the Pulitzer Prize. Meanwhile, his 1996 book, Into the Wild, remained on the New York Times bestseller list for more than two years. In 1999, the Academy of Arts and Letters awarded Krakauer an Academy Award in Literature to honor his exceptional writing and investigative journalism. Under the Banner of Heaven, a study of religious fundamentalism in the American West, and Where Men Win Glory, a profile of professional football player, turned army-combatant, Pat Tillman, followed in 2003 and 2009, respectively. Krakauer’s most recent book Three Cups of Deceit, published in 2011, investigates alleged fabrications and fraud surrounding Nobel Prize nominee Greg Mortensen. A fearless and adventurous reporter, Krakauer has continued to push boundaries through his writings in publications such as Outside, GQ, National Geographic, Rolling Stone, Architectural Digest, The New Yorker, The New York Times, The Smithsonian, and Byliner.com, where he currently contributes. Into the Wild is based on the life and death of Chris McCandless, a young man from a well-to-do family, who gave up all his worldly possessions, and hitchhiked throughout the U.S., to Alaska, between 1990 and 1992. He trekked into Denali National Park and lived off the land for 113 days before apparently dying of starvation. McCandless’s journey is shaped by American economic, cultural, social, political, and technological trends of the 1990s, primarily represented by his parents, whose affluent lifestyle, careerism, and success in the aerospace industry mirrors the economic prosperity of the period, the elevation of the meritocracy to prominence, and the rise of the information age. McCandless’s rejection of his parents’ values as well as his concern for world hunger and South African apartheid also parallel the development of “alternative” subcultures in the early ‘90s and the decade’s growing awareness of global issues. Lastly, McCandless’s story figures prominently in the rise of New Media, or mass and instantaneous communications. McCandless disappeared at the cusp of the digital age, only a few years before the invention of email, (1993), and the popularization of the cell phone, (1995), two devices that could have hampered his mission to live off the grid. Ironically, the discovery of McCandless’s body in September 1992 set off a media firestorm that circulated McCandless’s story in almost every medium from print to film. While propagating McCandless’s image, these communications also debated the merits of McCandless’s elevation to celebrity status. Because McCandless became infamous posthumously for his bizarre death, McCandless’s rise to fame reflects the popularization of reality TV, which came into vogue in 1992 with the MTV series The Real World. Interestingly, if it were not for this great deal of media attention, McCandless could have easily become just another idealistic young man who walked into the woods never to be heard from again. Krakauer’s book and McCandless’s odyssey is situated within a literary legacy that stretches from the transcendentalism of Henry David Thoreau’s Walden to the naturalism of Jack London’s The Call of the Wild. Like Thoreau, who spent two years pursuing a “simple” life in the woods of Concord, Massachusetts, McCandless sets out alone into the Alaskan bush to live off the land and create a new identity. McCandless’s solo quest for a “raw, transcendent experience” also reflects the transcendentalist values Thoreau espoused in his works, among them, individualism, self-reliance, anti-institutionalism, and finally an exhortation for man to simplify his life, live it to the fullest, and find a personal connection to God and nature. An heir to Thoreau’s transcendental tradition, Into the Wild is also a successor to Jack London’s The Call of the Wild. McCandless was not only a fan of Jack London, but Krakauer’s Into the Wild also exposes striking similarities between McCandless and his icon’s life and work. Like the young Jack London, McCandless was a fearless adventurer, traveler, and wanderer. Like The Call of the Wild protagonist Buck, a domesticated dog who follows his instincts to become a wild wolf, McCandless also answered the “Call,” giving up his worldly comforts for a free life in nature. In addition, McCandless’s death mirrors the death of a man who succumbs to his follies and the might of nature in London’s short story, “To Build a Fire.” Similarly, London’s early death as a Socialist who never came to terms with his financial success parallels McCandless’s untimely death as a young man who fell victim to his fiercely idealistic beliefs before ever having the opportunity to fully shape them. Other related texts include Boris Pasternak’s Doctor Zhivago and writings by Russian writer Leo Tolstoy, transcendentalist Ralph Waldo Emerson, and American naturalist John Muir. Setting: Alaska, South Dakota, the American Southwest, and Mexico. Climax: When Chris McCandless decides to return to civilization, but turns back into the wild because he cannot cross the Teklanika River. Point of View: Journalist Jon Krakauer reports from a third person perspective and occasionally the first person. The Evolution of Into the Wild. Jon Krakauer first covered McCandless’s death for Outside Magazine in January 1993. In the years following, he extended the article into a full-length book, Into the Wild. Actor Sean Penn adapted the book for the screen, writing and directing a critically acclaimed film version, starring Emile Hirsch, in 2007. A Mysterious Chemistry. The confounding circumstances of McCandless’s death prompted Krakauer to turn to botany and chemistry for answers. In Outside magazine Jon Krakauer initially theorized that McCandless died because he mistook poisonous sweet pea seeds for those of an edible potato plant. After working with a team of chemists while writing Into the Wild, Krakauer proposed another theory for McCandless’s death—alkaloid poisoning from wild potato seeds. Krakauer amended his theory in later editions of the book, attributing McCandless’s death to paralysis and starvation by swainsonine poisoning. In 2013, Krakauer published an article in The New Yorker that definitively asserted McCandless’s death to be the result of lathyrism, a paralyzing neurological disease caused by a toxin in potato seeds, known as ODAP (beta-N-oxalyl-L-alpha-beta diaminoprionic acid). However, the case is not settled and there is still debate about what exactly caused McCandless's death. Campodonico, Christina. "Into the Wild." LitCharts. LitCharts LLC, 11 Aug 2014. Web. 24 Apr 2019. Campodonico, Christina. "Into the Wild." LitCharts LLC, August 11, 2014. Retrieved April 24, 2019. https://www.litcharts.com/lit/into-the-wild.